Familiar with Vagrant? Download the box. Match your production servers locally. Configure Chassis to run the same version of PHP as your production servers, including PHP extensions. Never hear “it worked on my machine!” again. We built Chassis Desktop as an easy-to-use UI for everyone from developers to designers to project managers, beginners to experts. But it doesn‘t stop there. We‘ve filled Desktop with power-user tools, like keyboard navigation: just hold ⌘ to view shortcuts. Need more control? Drop down to the terminal and work directly with Vagrant. We can‘t be everything to everyone. Fortunately, with Chassis‘ ecosystem of extensions, you can build a system to your exact specifications. Install memcache and add it to PHP (uses PECL memcache). 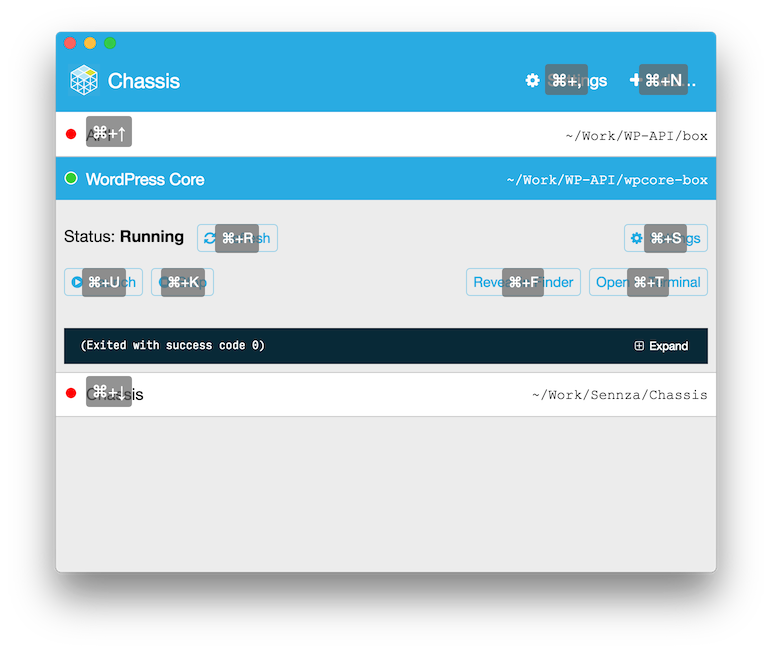 Just like WordPress, Chassis is 100% open source, with 20+ independent contributors. Chassis is a community project, with commercial support from Human Made. Made with ❤️ just for you.